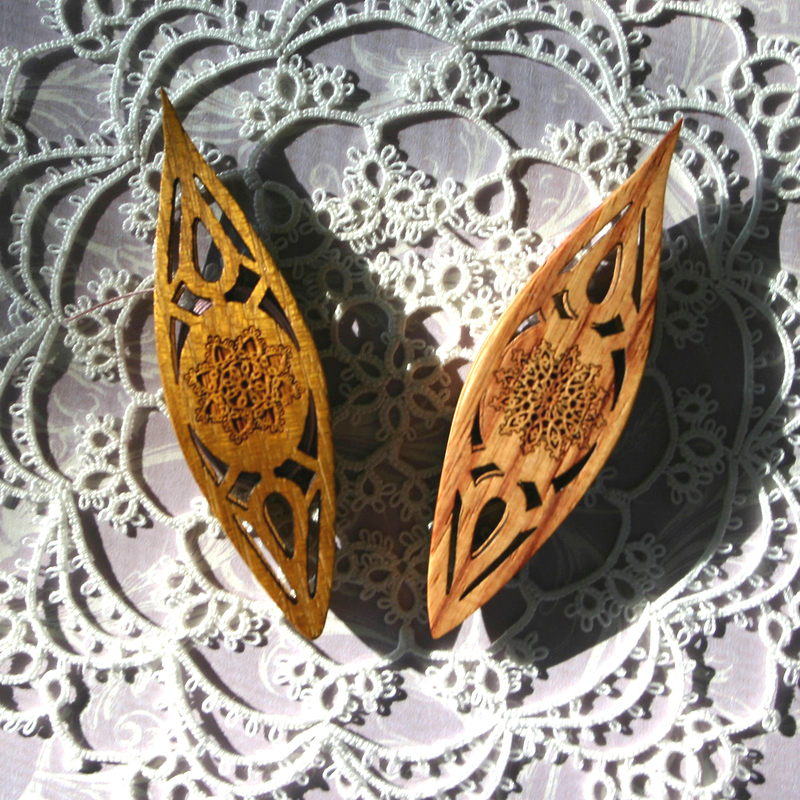 Old Wooden Tatting Shuttles on Tatted Lace. Tatting is very different from crochet in terms of how the laces are made. Both can be used to make temple altar cloths, so what is the difference? Tatting and crochet lace can sometimes look similar, partly because crochet lace can so easily mimic other laces. There are differences though. Between tatted and crochet laces, can you tell the difference? It’s tricky because crochet mimics so many different types of lace. 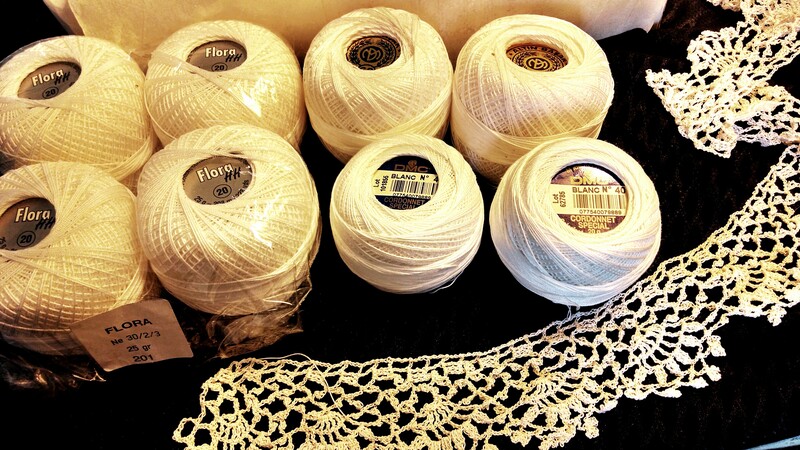 There are bobbin laces, hardanger, reticella lace, needlepoint lace…. lots of old fashioned laces to mimic. Crochet mimics them all, and does it well because the mimicry can be done in a fraction of the time that the older style laces could be made. Less time to create meant more could be made, and time is money. In those old days where lace was so closely tied to social status, lace was a big deal, and a large part of the European culture. Irish crochet was the one instance I know of where crochet was sought after for its own beauty rather than speed. Speed and versatility are some of the main reasons crochet is still around, and the other laces faded first. The secret to the speed, is in the hook. The second difference between tatting and crochet is how the thread is wound, looped and knotted. Tatting is made with the shuttle passing in, out and around a loop of thread wound around your hand to tie a simple set of knots. 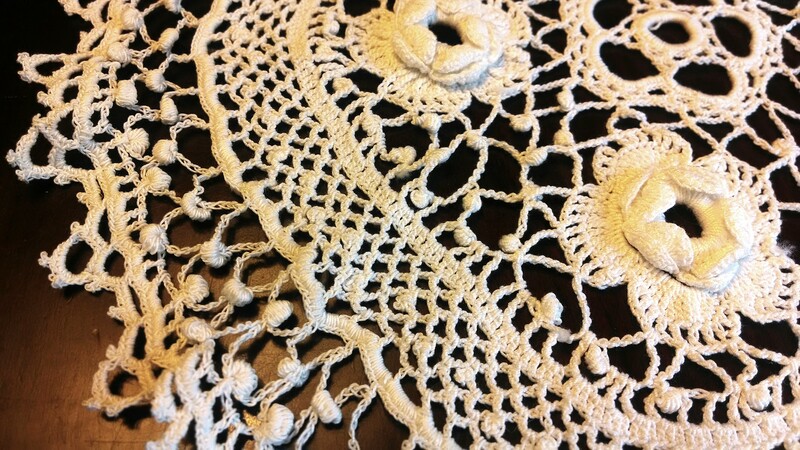 Those knots are then arranged in marvelous ways, with picots and a few other variations, but in general, strings, loops and picots are what tatting is known for. Crochet is a series of loops pulled through other loops in a variety of ways. Crochet can look like cloth, or like lace, and everything in between because there are more ways to connect the threads than just picot connections. You can see the difference between tatted laces and crochet laces if you study pictures of the types of lace. You’ll soon see that tatted lace has a fairly uniform look, and crochet varies widely. Tatting and crochet laces use the same thread sizes, and that makes them similar. They also have similar designs with various styles of loops and picots, some look the same, but some look very different from each other. In tatting, there are rarely any straight lines, everything is made of rows of curved stitches and picots. Picots are those little loops that make it so frilly. In french, tatting is called frivolete, for that reason. People LOVE tatting because it is so frilly and delicate. Crochet can’t replicate tatting precisely, but as a lace maker and designer, I use tatting principles in the designs I make, because they are so appealing. I know my eye loves those picots, so I add them wherever possible, and covered chains are more appealing than uncovered ones. There are many kinds of picots in crochet, especially Irish crochet. People LOVE Irish crochet partly because of the picots. There’s something about a picot that is appealing. I don’t know what it is, but I’m smitten with it too. They remind me of baby’s breath. My favorite picot is very different from a tatted picot, it’s called a clones knot. In this piece, you can see both crochet picots, and clones knots. The clones knot looks like a little ball, where a picot is more like a frilly bump. Both types of lace can be plain, or intricate, depending on the design. 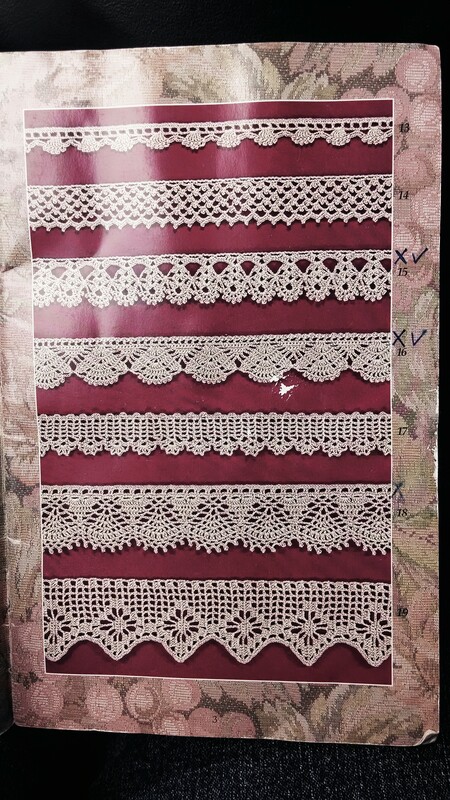 The art of lace making is in the design. The rest is skill, but an eye for beauty transforms a useful skill into an art. Very interesting. My mother did work with sewing thread and a needle. She called it “tatting”, but I guess it was the crochet…..still, very beautiful. There is also needle tatting which creates the same look as a shuttle tatted piece. So it could very well be that your mother really was tatting after all. 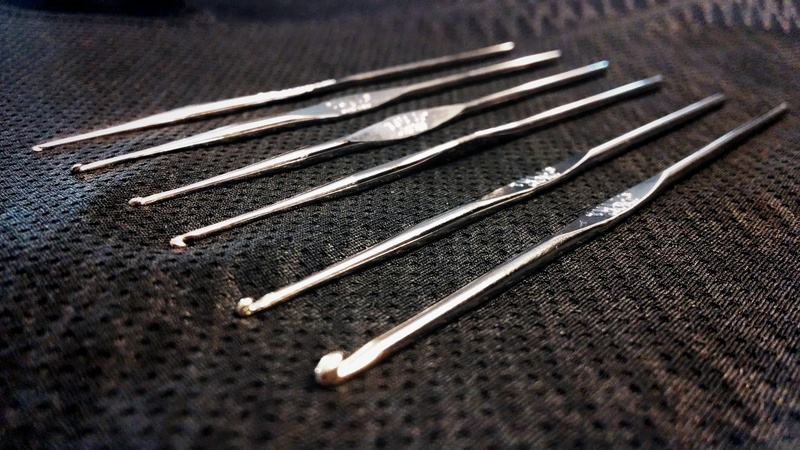 Actually, if you read the history of tatting, sometimes a sewing needle was used just like a shuttle was used. On rare occasions, we do see so called needle tatters that actually still do this, and they assume that this is needle tatting. So, unless you can remember how she was using her needle, we will never know if she was doing needle tatting or shuttle tatting while using a needle instead of a shuttle. Do you have any pictures of her tatting something??? If so, please post them!!! I love to look at vintage pieces, especially tatted items from the 20s and 30s. I have done needle tatting in the past and this inspires me to pull it out and do it again! I was never able to master traditional tatting but needle tatting looks the same to me and is equally beautiful. 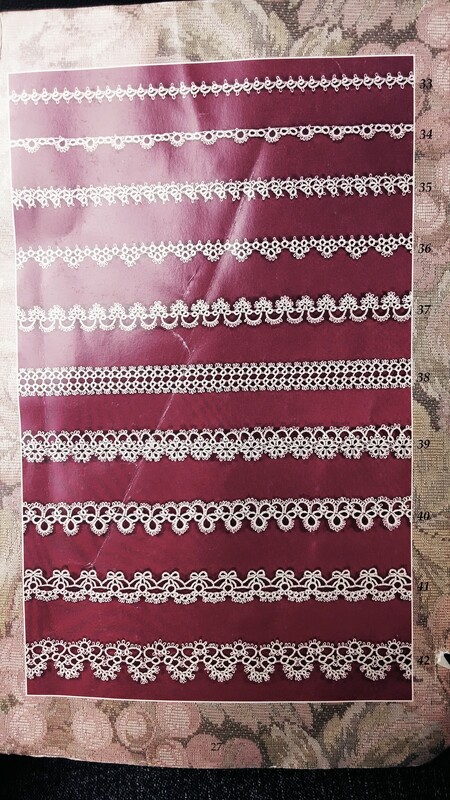 I think traditional tatting patterns can be used, too, to needle tat. I have wanted to make an altar cloth for years and I am grateful for the info on this site. The tatting shuttles are actually not old. They were made by Chris Hinton from The ShuttleShop a few years ago. Tehse were from Tatting Chic’s collection if I remember correctly. My grandmother used to do tatting and had several things passed down to my Mother.. I have been into crocheting lately and would love to learn how to tat.. Do you know of any tatting classes? There are great tutorials on youtube for learning basic tatting skills. You can also look it up at the library, but I like to watch it being done in person if possible. Often the senior center or library know about local opportunities to learn random things.